From the beginning of the Church’s liturgical life, hymns have been used to teach or, more accurately, to preach. The long history of hymnody contains many figures — not all of them orthodox — who recognized the power of singing to instruct, encourage, and inspire. Along with St. Ambrose, Martin Luther was one of the greatest champions of music’s theological and pastoral significance. That prose translation of the final lines of the hymn’s first verse sacrifices the power of Luther’s poetry in order to render more precisely Luther’s theological claims. The complete text in German, with a prose translation, is available at the Bach Cantatas Website. The Wikipedia article on this hymn includes a metrical paraphrase of Luther’s text by George MacDonald. In Lutheran churches, this hymn was often sung on June 24th, when the Feast of the Nativity of St. John the Baptist was celebrated. Since it serves a catechetical purpose, it may also have been sung in services in which baptisms occurred. Since this hymn is not in our Hymnal — and since the Gospel reading of the account of Christ’s baptism is read every year on the Second Sunday after Epiphany, and we need a good hymn to sing to commemorate this important event in the history of redemption — I’ve prepared an insert for our bulletin that includes a simple harmonization of this hymn and three of Luther’s seven verses as translated by Richard Massie (1800-1887). You may download that insert here. 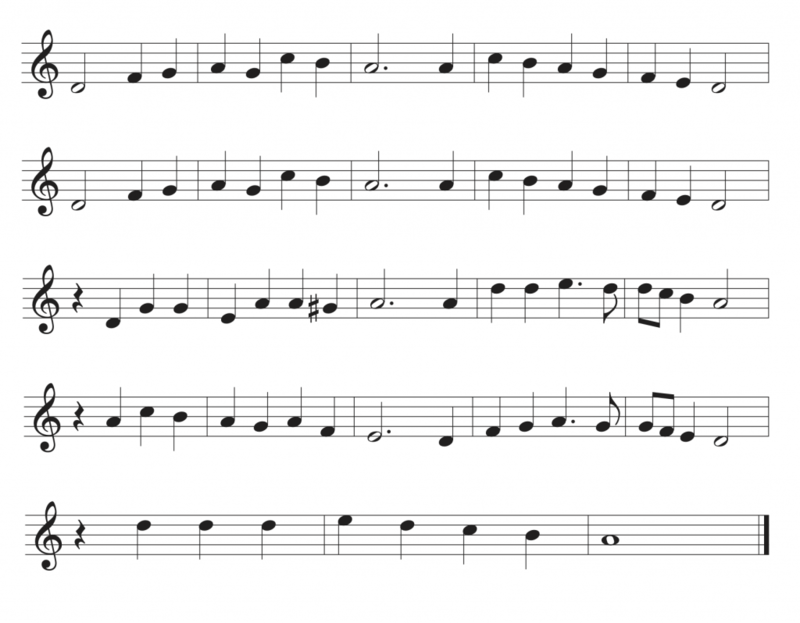 As is common in many chorale melodies, the second line of the tune is a repetition of the first line. The third and fourth lines are more active, and reach a bit higher. The second half of the fourth line is effectively an abbreviation of the hymn’s first line. The melody sounds as if the tune ends with the fourth line, but a final and dramatic half-line is added, the first note of which is a full octave above the last note of the fourth line. Many 16th and 17th-century Lutheran composers wrote pieces for organ or chorus based on this melody; they include Hans Leo Hassler (1564-1612), Michael Praetorius (1571-1621), Dietrich Buxtehude (c.1637-1707), and Johann Pachelbel (1653-1706). The Ensemble Sweelinck of Geneva has recorded a medley of settings of CHRIST UNSER HERR ZUM JORDAN KAM by three different composers. First, they sing a simple chorale setting by Joachim Decker (1565-1611), then an earlier version by Luther’s colleague Johann Walter (1496-1570). The melody in this setting is sung by the tenor, a common convention in sixteenth-century music. Finally, they sing the Kyrie and Gloria from a Lutheran mass based on this melody, written by Christoph Bernhard (1628-1692). While many of his predecessors explored this melody’s possibilities, Johann Sebastian Bach gave it a more extensive work-out than any of them. Here is a simple chorale setting by Bach (BWV 280) for four voices, sung by the Vokalquartett der J.S. Bach-Stiftung. Bach wrote two chorale preludes based on this tune. In the longer of the two, BWV 684, the melody is played in a low register on the pedals while both hands are kept busy exploring related musical ideas. Here is this prelude played by organist n Kay Johannsen. Finally, the most expansive treatment of this hymn is in one of the three cantatas Bach wrote for the Feast of the Nativity of John the Baptist. Cantata BWV 7 takes its name, Christ unser Herr zum Jordan kam, from the hymn, and two of its seven movements take their text directly from Luther’s own words, while the other five movements reflect the theology of the hymn. The first and last movement also use the hymn’s tune. Here is a complete performance of Cantata No. 7 featuring the Holland Boys Choir and the Netherlands Bach Collegium conducted by Pieter Jan Leusink.